It was 7 a.m. on Tuesday, February 18, when Elaine Newbold got the call from the Benzie County Sheriff’s Department that the vacant Beulah bowling alley’s roof had collapsed under yet another onslaught of snow and that parts of the building lay sprawled across Benzie Boulevard. “My first thought was, ‘Oh my God’,” says Newbold, who together with her husband, Randy, have owned the building for three years. (No one has bowled there in eight years, however, since Mike Messina ran the business.) Randy had left town on business the day before, so it was up to Elaine to deal with the mess. Five months later, the eyesore in the heart of downtown is slowly but surely starting to blink awake. Behind a temporary plywood wall facing the street, the Newbold’s contractor is busy hammering and sawing away. Elaine hopes that the project will be ready for the community to view this fall. The Newbolds envision a restaurant in an attractive, open-air courtyard that faces Benzie Boulevard in the space that was once occupied by the bowling alley lanes. The bar and indoor seating will remain on the south side of the building, and retail shops will occupy the north side. Once complete, the Newbolds hope to sell the space to a restaurateur. Elaine says that several interested bidders have already approached them. Elaine admits that some had misconceptions about what the Newbolds intended to do with the vacant space, but that has changed as people see progress on the building. The Newbolds also own Crystal Lake Adventure Sports, the only kayak and standup paddleboard outfitter on Crystal Lake and an instigator behind popularizing standup paddleboarding in Northern Michigan. For 20 years, the outfitter has been an important part of Beulah’s summertime economy: as ubiquitous to the tourists in downtown Beulah as Crystal Crate & Cargo, Northern Décor, East Shore Market, L’Chayim, and the Cherry Hut. Crystal Lake Adventure Sports will host the second annual Up North Standup Paddleboard Classic on Saturday, July 19. The family-friendly event features both a recreational and competitive race. Participants depart from Beulah beach and paddle a three- or six-mile triangle on Crystal Lake, then travel to Lake Michigan, a 4.6-mile downwind duel from Point Betsie to Frankfort beach. The inaugural event attracted 100 participants last year, and Elaine hopes to add 150-200 more racers this year. The Paddleboard Classic gives downtown Beulah a mighty boost in business, and come this fall, or perhaps by next summer, Elaine hopes that a thriving restaurant in the former bowling alley space will be another shot in the arm for this quaint village between US-31 and Crystal Lake. “The village of Beulah is going through a regrowth period right now,” says Elaine, who describes the local economy as being in the valley of a 20-year cycle. The Five Corners Watch and Clock Shop is vacant, so is the Brookside Inn on US-31. But the bowling alley has long been the elephant in town. A decade ago, by contrast, Beulah was buzzing, and there wasn’t a vacant storefront around. “We need more retail stores, more variety. The more the merrier,” echoes Kitty Elly, owner of Northern Décor. “Beulah needs a shot in the arm,” chimes in L’Chayim’s Jonathan Clark. “Something to draw folks here year-round,” says Cindy Frieswyk at the Market Basket. Berlin agrees with Elaine Newbold that Beulah hit the bottom of a 20-year cycle, and for that she cites the national economy. Tourism spending depends on discretionary income, of course, and the 2008-09 Great Recession had a nasty trickledown effect on Beulah. But she sees signs of a local upswing. 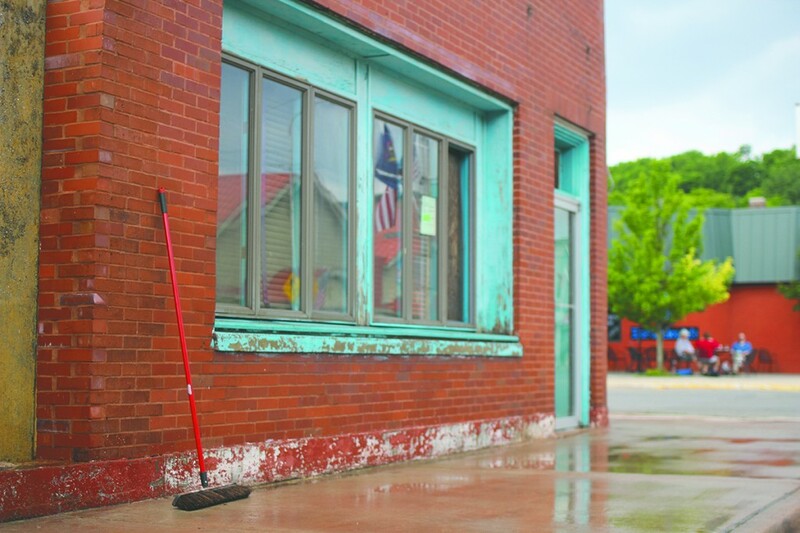 Did you catch Ian Richardson’s story “A Day in Beulah: a small town with a big city soul” in our July 3 edition? It’s the perfect guide for how to spend a day in Beulah. Find archived copies of The Betsie Current at Charlie’s Natural Food Market at the top of the M-115 hill, next to the fitness center, just outside Frankfort. Photo © Aubrey Ann Parker.